So the Spurs finale at the Lane was pretty epic. The victory against United, which of course I never doubted for a second would happen, and then all the old legends came out onto the field in pouring rain, and Kenneth Branagh’s video, and the rousing rendition of Glory Glory Tottenham Hotspur (“Pride of northern London and the KINGS of WHITE HART LANE…” yeah, I got a bit salty-discharge-eyed) and the clouds broke and sunshine poured in mid-chorus, and That Rainbow which was an unbelievably Hollywood moment of perfect timing (and did you see Glenn Hoddle? Raising his eyebrows and pointing his brolly up to show his fellow 80s legends, who were all thinking, Glenn, don’t get too excited mate, it’s just weather!). Yep, in my living room which we had decorated with Tottenham shirts from through the years (happy mother’s day, by the way), we watched and felt very moment. And all those years that I have been singing “Spurs are on their way to Wembley,” and now I really don’t want them to. And today, the bulldozers are already in digging the old place up. But enough of all of that. 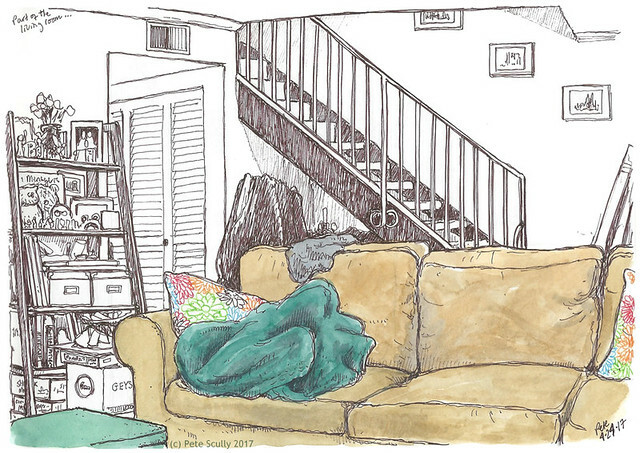 This is a completely unrelated sketch, except that it is of the couch where my exiled-from-north-London bottom was sat watching it all from 5000 miles away. This sketch however is from April, on a day when I was home from work sick, and lying on the sofa. Sofa away, you might say. My husband watched the game but the broadcast ended before the celebration. We were disappointed. Honestly, watch it online. It was amazing. Not very long, but the whole stadium singing “Glory Glory Tottenham Hotspur” in the rain and then the sunlight breaks through with a big rainbow perfectly placed just as the chorus reaches its peak, well, I’ve not seen anything like it. What a way for the stadium to say goodbye. These look like cleaned up Robert Crumb drawings. Did you miss the sixties?